I've been heavily focused on Brazilian Jiu-Jitsu these past few months but have been mainly doing open mat at the college as it's 2 minutes from my house. But this week I decided to drive over to Team Quest and check out their Tuesday night Gi BJJ class that is technique focused. The classes are now lead by Professor Bruno Carvalho who is a 3rd degree Brazilian Jiu Jitsu Black Belt originally from Brazil. 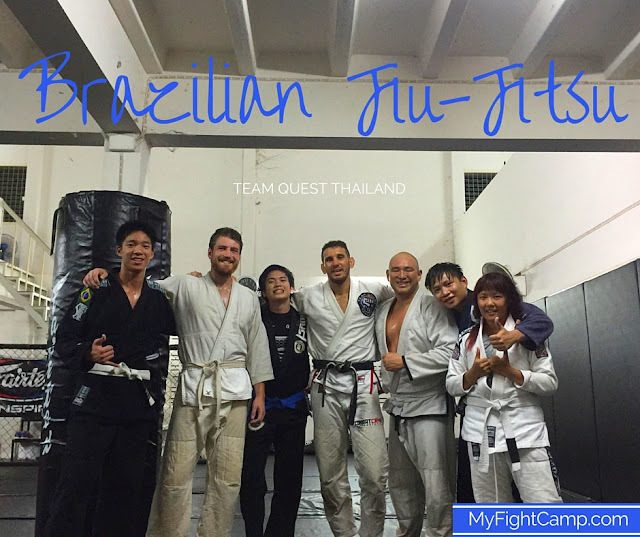 Here are my first impressions on the BJJ program at Team Quest Thailand and the training with Bruno. The gym is no longer brand new as I remember it but still a great place to roll. 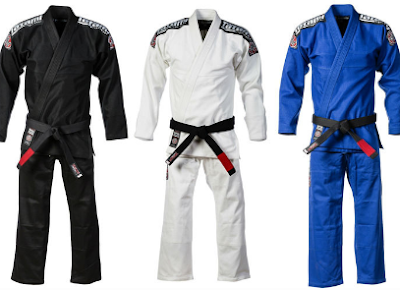 Just make sure you bring your own Gi as they don't have a selection of loaners. Black, White or Blue? Just don't' bring camo. It's hard to say as I've only been to one session so far, but it seemed like a decent mix of regulars and beginners who have been there for just a few weeks or less. The biggest benefit of training down in Southern California or Phuket would be having a ton of training partners to roll with. Right now Chiang Mai's scene isn't big enough to be consistent, but it's growing and by having a legit Jiu-Jitsu program at Team Quest now it's going to attract more and more students. Even before I went to class, I already knew the the new trainer would be good to work with. I knew that he was a legit black belt originally from Brazil, and he's had a lot a ton of BJJ competition experience as well as 25 MMA fights, but that doesn't always means they are a good teacher or patient with new students. I happened to skype with my buddy Nicolas Gregoriades, another great black belt and as soon as I mentioned Team Quest, he immediately said that Bruno was super legit and that I would enjoy the class. Here's a highlight reel of Bruno's MMA fights, definitely worth watching. What really impressed me about Bruno was how patient he was even with the total beginners and when I was just not getting a technique he was teaching. I was also really glad to see that he would roll with students after class during the sparring sessions, and after 5 minutes rolling with him and being completely outclassed, I was reminded how big of a skill difference there is between me rolling with other white, blue and even purple belts at the university open mat club and rolling with a legit black belt. It was a humbling experience and was glad he went gentle on me as either way, his experience and skill showed me how much I still have to learn. But what impressed me the most and really cemented how legit Bruno really is was after class after he took of his Gi and everyone was ready to go home. Two students, stayed around to practice one of the techniques they had learned in class, and instead of getting on with his day, Bruno was more than happy to jump back onto the mat to help them. If I was coming to Chiang Mai for the first time, or if I lived closer to Team Quest, I'd go there as my default BJJ gym. With their great new black belt, and open mat sessions on weekends, it's definitely worth the membership. 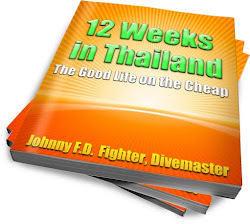 I'd really like to see the BJJ scene grow even more in Chiang Mai as it's my favorite city in Thailand and much more affordable and livable than Phuket. We'll see how fast the scene will grow to a point where there are multiple training partners for all size people and belt levels, but so my experience has been positive enough for me to recommend it, and I'll be going back to Team Quest for their Thursday class tonight. If you want to check out their schedule, pricing, and find out more info, you can go to Team Quest Thailand's website here. Hey its Zak. We've met before. You sold me some Chia seeds when I was in Phuket. I'm coming back to Thailand in March. I'm going to Phuket again first, but will fly to Chiang Mai and check that out as well. Are you still there in Chiang Mai? Yeah, I bought your book on kindle. It was helpful. I won't be there until at least middle of April because of that pollution and am going back to Phuket first before going to CM. That post is great. I like the stuff about the digital nomads working area. Do you have a larger size image of that map you made? Hey really glad you enjoyed the book! 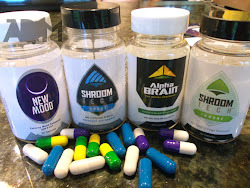 Do me a favor and leave a review of it on Amazon if you haven't already, it really helps spread the word! Also which map are you referring to? I'll be happy to upload a bigger version if I have it. Thanks for the help. I definitely won't be there till mid april as I'm going to Phuket first and don't want to be there when the pollution is. I heard beerspace or whatever its called is a good meetup. I'll check it out when I get there. I did have another question regarding flights. Since your comments here is getting filled up with non-bjj relatated stuff from me, I sent it to your johnnyfd fb page. I like those fight arts. They make the ordinary fight look sophisticated and disciplined. That looks good to me! I would like to go in those trainings too. I like those eastern fight arts. thanks for this first training day! I suppose it was unforgettable, I wish you more power!